Happy holidays! We hope you have had a nice holiday season, filled with love, peace and good will! It's here at last, Our Volume 3 - our apologies in the delay of release, we hope that this issue serves as an extra special christmas present. This issue is bursting with creative people from all the edges of the world. 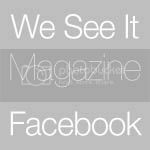 We would love you to read the issue and share it on your sites, blogs and networking pages. Until then, enjoy this issue, share it and let us know what you think!